This was our final wild camp for 2018 and to mark the last one and the festive season we planned a night in the East side of the Brecon Beacon for a change at a small bothy at the edge of Grwyne Fawr reservoir, just nothing went to plan. The two issues we had with trying to make it festive was the weather being overcast and somewhat damp and finally when we finally arrived at the bothy it had already been taken by some very sleepy hikers who had the same idea as us and arrived a lot earlier in the day (Better prepared) and spent the day sleeping. My festive weekend in the Brecon Beacons began in the West side of the park at one of my favourite spots in the area called Fforest Fawr Geopark at a lake called Llyn y Fan Fach which many of you will have seen from previous camps over Summer. For some time now I have had a shot in mind and needed bad weather (which might come as a surprise) to make it dark and gloomy so I could focus on the lines of the sandstone to create something a little more minimalist. Ideally I needed high cloud in order to get up on to Fan Foel so you can get a clear view across to Picws Du and Waun Lefrith. However, it wasn’t meant to be and on the drive down to Llyn y Fan Fach’s car park in the lower valley you could see thick clag sitting on the mountain range. I shouldn’t be surprised as this area quite often has low cloud as the mountain range here is 800m+ above sea level and typically the cloud hangs around this side of the park rather than central or East Brecon Beacons, being further in land. Several camps around this area in Summer has it started out clear and very quickly has cloud rolled in from behind and snuffed any opportunity of astro shots or a clear view for sunrise across the park. So with my original shot in mind went out of the window so now with nothing in mind to shoot it was a case of just wonder up and enjoy the walk, some time in the outdoors and be thankful it wasn’t raining. On the walk up you could see other walkers across the range coming down from various points on the lake as they tried to venture right, on to Waun Lefrith or coming down from Fan Foel and likely Llyn y Fan Fawr, the other mountain lake. Despite the thick low cloud it wasn’t putting anyone off climbing in to the clouds and not being concerned about not seeing anything. As mountains go this is a nice area to be for all experiences, no matter the weather. You’ll still need to be prepared but as long as you hug the ridge line across Picws Du and back around Fan Foel you can general find your way around the range fairly easily. Even the climb up from the car park which is a mere 30 minute walk up to the first mountain lake and is a gentle climb along a gravel footpath. Only until you reach the mountain lake does it begin to get boggy when you venture off around the mountains. A word of warning this time of year gaiters are a must for the area as it’s very boggy. And having seen some surprise visitors in the area I quickly found my own advise above worthwhile. The only things that weren’t venturing in to the clouds were the wild horse which were staying low but well away from the steady trickle of walkers along the footpath so to get close you had to venture off the path and begin wading through bog and long grass to get close enough. 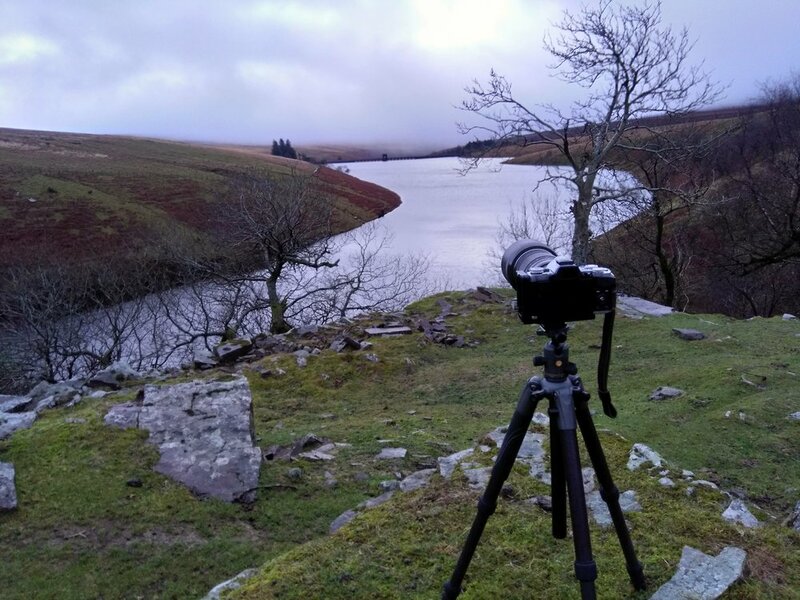 Facts on the area: Llyn y Fan Fach means “Lake of the small hill” - Waun Lefith which is the first mountain adjacent to the lake is a mere 677m, venture around the ridge to Fan Brycheiniog the highest peak in the Black Mountain, where Llyn y Fan Fawr sits is 802m and this lake means “lake of the big peak”. Despite being the end of December and days before Christmas Day it was still very warm. To warm in fact and at 12ºc it didn’t feel festive or that cold camp we wanted huddled around a bothy fire. By this point the outer jacket had been taken off. This being the latest Decathlon Cold Weather kit I have in, as I mentioned one issue it wasn’t cold and having been wrapped up in the full kit I selected to review I was very hot! So this bothy up on top was helpful as I quickly dived in to take some layers off and begin my climb back down to find Gareth and Jim over in the East side of the park at Grwyne Fawr reservoir. The one issue with Winter - Not much day light and by the time I arrived at the car park it was 12:30pm, with the walk up and little wander around the lake it was already 3pm so light was quickly disappearing and I had an hour and a half drive across the park to get back. For anyone who hasn’t visited the National Park before, it’s surprising big and with the mountain and winding country roads where you dare go faster than 20mph due to pot holes and slate walls collapsing it makes the 45 mile drive across fairly slow. Even 4x4 aren’t indestructible. On the drive to Llyn y Fan Fach car park its a tight single lane country road with slate walls either side and a fair few pot holes to contend with plus the latest edition of speed bumps? Yes, speed bumps in the mountains… Anyway the speed bumps are lethal and even crawling over a mere 2-5mph you feel the whole car jump and at the same time you have to drive around pot holes and fall slate from the walls. Some tourists had hired out a Landrover Discovery so they could get up to these mountain car parks and venture about, a good idea to be honest. What isn’t a good idea is darting down these roads at 30mph and wonder why you end up with a 4 inch cut in the tyre, a flat tyre on the opposite side and stuck in a slate wall. When I meet them on the road back it was already 3:30pm so we had 20-30 minutes of light left and if you are on any other network other than Vodafone around here you’re stuck. It’s a complete deadspot but fortunately the couple who had destroyed their hire car were already on the phone to recovery and they were on route. By this point I couldn’t do anything other than tell them where we were, coordinates and where the closest town was to get new tyres. Leaving the stranded couple as the recovery vehicle made its way up the track I returned to my journey, but on route needed to find firewood and mulled wine for our festive night in the bothy. Could I find firewood in any farm shop? Nope which was a big surprise but plenty of Welsh beer, mulled wine and food to enjoy! I finally arrived at Mynydd Du car park around 5pm and as you will imagine it was dark by now, add were in a Dark Sky Park and surrounded by pine trees and stuck in a valley I had no signal and it was darker than usual. So whilst waiting I brewed myself a coffee and sat in the car scanning through the few photos I took earlier in the day. At this point had I only realised the issue with my camera. Changed to the next, that was flashing red. Oops! Having not used my camera for a couple of weeks and completely forgot to charge them before heading out I had a camera with next to no juice to shoot. Kind of glad the weather and conditions were poor to shoot in now or else I’m sure I’d had missed something good. Shortly after my panic and throwing batteries about the car I then realised my next problem… I forgot to pack my USB charger. I hadn’t seen Gareth in a number of months so before Jim arrived around 8pm we had a catch up about changing systems, outdoors and plans for the New Year with the first trip our Winter camp in South Snowdonia or back in the Brecon Beacons. 8pm quickly came round and Jim eventually joined us but as usual the three of us weren’t ready for our small walk up to the bothy so bags out and start repacking. As a group of outdoor enthusiasts you won’t find a bunch of faff quite so much as us. The walk up to Grwyne Fawr Bothy is an easy one but a route you do need to know, a number of other paths lead off down to the reservoir. (I will put my ViewRanger route here shortly so you can download and follow if you ever wish to follow. Sorry I’m being slow and lazy. It’s Christmas after all). For this reason where me and Gareth had never visited this bothy before we waited for Jim’s arrival so he could lead the way. It’s about 45 minutes walk up and over but my advise is go earlier in the day. As we made it to the bothy and could see it on the top ridge we noticed no lights were on so we were overwhelmed with excitment and began to slide down the boggy hill to begin our festive bothy night. On approach however, we noticed the smell of wood burning. None of us clocked at first this was a bad sign as it continued to excite us further as Jim had firewood at the ready. Jim slowly opened the door and whispered is anyone here and from above three weary eyed walkers peered down at us looking confused. It would seem they had been asleep for sometime and had lost track of the time. They arrived around 3-4pm and went straight to bed. 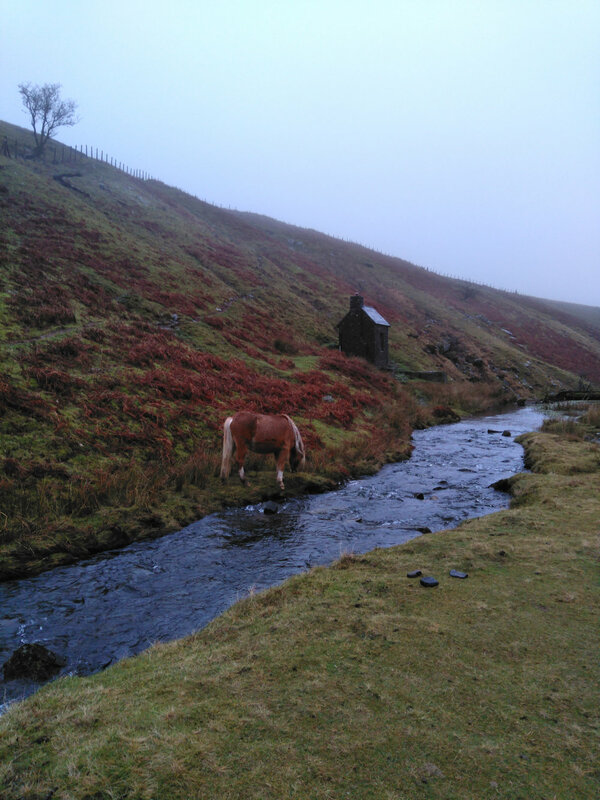 So, as you will see from the photos above and below we abandoned the bothy. (It only sleeps four and that’s a squeeze). We ventured across the river and on to the hillside to pitch up around one of the picnic spots, complete with a firepit used earlier in the day. It wasn’t a bothy with open fire but it was a fun night cooking up mulled wine and laughter as we ended up sliding about the hill trying to find a composition of the moon and our tents decorated with Christmas lights. It wasn’t what we had planned but we were finally feeling festive at this point. Over night we had some rain and with a belly full of mulled with and a river behind us by 5/6am the following morning all three of us were busting for the loo! Fortunately by the morning the rain had stopped and as we climbed out of our tents we could see the rain and clouds breaking over the hills in the distance. Gareth had to leave by this point so we said our good byes but me and Jim stayed for a few hours as we climbed to the top of the ridge we were camped and stuck around for some photos over the reservoir. It wasn’t long however until the rain and mist reached us and our clear view descended in to nothing but sheet white. It was time to say our good byes and pack up and return home. Vanguard Photo Wanderlust Sedona rucksack - Review coming soon. Transparency Notice: Please note that I (Matthew Holland) receive free products for review from brands and manufacturers, but I only accept products for review on condition of total independence and no guarantee of endorsement. I am a Vanguard Photo UK and Snugpak ambassador and receive the products for free to review from both brands. The review is no guarantee of endorsement. I receive no monetary gain from Vanguard Photo UK or Snugpak from the reviews or discount codes. Any Vanguard kit I own has been bought by myself. Any Snugpak equipment is gifted to me for the purpose of the review. I work with MyOutdoors who receives free products for review from brands and manufacturers, but we only accept products for review on condition of total independence and no guarantee of endorsement.